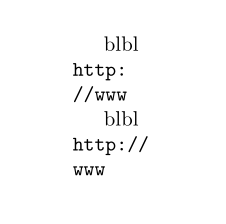 Removing the http:// would be easy with biblatex/biber (but more difficult if the link should remain clickable). With bibtex you would imho have to patch \url. Not the answer you're looking for? Browse other questions tagged bibtex line-breaking urls or ask your own question. How to use multiple URLs for one bibtex reference? How do I add the URL to a phjcp/similar bibliography style?